Lean and Six Sigma are complementary philosophies. The difference in Lean and Six Sigma lie primarily in the focus. The elimination of waste with Lean is fairly similar to the reduction of variation in Six Sigma. However, Lean’s focus on improving workflows is perhaps the main differentiator. By focusing on the workflows, lean efforts ensure that non-value-adding aspects are removed from the value stream. Lean efforts help make sure that we are doing the right things. Six Sigma initiatives help make sure we are doing the right things right. So??? Which should *we* do? There are lots of good arguments for Lean and lots of good arguments for Six Sigma. Some companies have even combined the concepts of both calling what they “do” Lean Six Sigma. In our opinion, which approach is best for a company depends on the company culture, support from senior management for one or the other, and in-house expertise. The important thing is that you “do” something that encourages and facilitates continuous improvement, customer satisfaction, and improved profitability. By streamlining the value stream (and dispersing functional departments), we can significantly reduce and often completely eliminate waste. Value Stream Mapping: Understand the sources of waste in the value stream and map the future state. Work Analysis: Collect detailed data on the work process and analyze that data. Macro Workflow: Plan physical changes to the flow and layout of the facility. Micro Workflow: Fine tune the flow and layout at the work center level. Why start with a value stream map? The initial value stream map serves as a jumping off point for improving the overall value stream. A value stream map documents the flow of a product from the dock of the raw material suppliers through the manufacturing facility to the customer’s dock. In addition to showing the steps that the product takes, it also shows the process performance of each step and the time of each step. What is involved in work analysis? The engineering studies set the stage for designing work cells, determining how to level load operations, defining labor requirements, and setting lean manufacturing goals. Effective work analyses cannot be done using historical data or educated guesses. Work analyses can only be done by going out into the process and timing operations. Some of the opportunities for improvement will become obvious even at this early stage in the process. While collecting process performance data and observing the process, constantly look for ways to improve the operation. With the employees that work in the area, develop ideas to eliminate waste. Sometimes an entire task or process step can be eliminated or combined with another task taking a big bite out of waste. Improve the workflow at a macro level. Identify natural work flows for products or product families. In lean manufacturing, functional departments are broken up and dispersed into cells where possible. Allocate the equipment based on work analysis data and the anticipated sales volumes for the cells. If two cells need to share a piece of equipment, consider making that equipment portable. If this cannot be done, then locate the common process equipment between the cells and flow the two cells around it. The ultimate goal for manufacturing cells is to start and finish production right in the cell, generating a complete product ready to ship as it exits the cell. Disperse the functional processing centers into work cells with sequential operations. Move equipment so that sequential process steps are in close proximity. Simplify the workflow; eliminate or combine steps where possible. Material handling and intermediate inventory are good candidates to eliminate. Monuments are pieces of equipment or departments that cannot be cost-effectively moved. Anchor the layout around the monuments. Use raw material entry and shipping exit points to select process flow locations. The process flows handling the greatest cubic volume should travel the least distance. The location of the entry (receiving) and exit (shipping) points is critical to a macro workflow. The greater the processing volume (in cubic feet), the shorter the overall distance the process flow should be. Don’t forget to incorporate support functions into the cells. For example, maintenance activities specific to a cell and special testing specific to a cell should be moved to the cell rather than kept in a centralized area. Design effective work stations at the micro level. Once the overall facility workflow has been analyzed and an overall or macro flow has been selected, it is time to focus the efforts at the specific cell and work station level. Remember to incorporate 5S concepts such as Sort and Set-in-Order techniques when laying out and organizing the cells and related work stations. Lean has a language of its own. We have separated lean terms into six subdivisions: General Terms, Workflow, Workplace Organization, Workplace Simplification, Process Improvement, and Measures. Waste: Any aspect of a task or activity that does not add value. Value Stream: All tasks and activities needed to transform input materials and information into an output. Current State: The current or existing view of the workflow. Product Family: A grouping of products using similar processing methods. Future State: A potential improved view of the workflow. JiT: Just-in-time means providing what is needed, when it is needed, in the quantity it is needed. One-piece Flow: A practice where product is moved from one workstation to the next one piece at a time without allowing inventory to build up in-between steps. Takt Time: The rate at which the customer uses a product. It is calculated by dividing the total daily operating time by the total daily customer demand. Bottlenecks: The step in a process line that limits the throughput of the entire process line. Pull vs. Push: Two diametrically opposite scheduling philosophies. Push manufacturing schedules are dictated by a formal production schedule where a new lot is pushed onto the first step of the process. With pull manufacturing, a customer order triggers the start of a new lot; typically empty kanbans pull new production from the prior process step. Monuments: Equipment that is too costly or disruptive to move is considered a monument. Kanbans: A visual signal, typically a re-order card or container that triggers a pull manufacturing system. The 5S’s: A formal approach to organizing the workplace. Work Cell: A cross-functional process line typically including equipment to process products (or product families) from start to finish. TPM: Total productive maintenance, an approach that leads to increased equipment availability by reducing downtime due to failure and unplanned (emergency) repairs. Mistake-Proofing: A mistake prevention approach. SMED: Literally “Single Minute Exchange of Dies.” It stands for set-up reduction, an approach that minimizes the time the process is down being changed over from one product to another. Visual Workplace: Use of visual controls and visual displays to help employees maintain control of their work areas and assess performance at a glance. DFA/DFM: Design for Assembly and Design for Manufacturability techniques that improve manufacturing productivity. Kaizen: Continuous improvement on top of continuous improvement. Problem-Solving Process: A formal, structured approach to solving a problem such as the 8D Process or DMAIC. Kaizen Event: A focused, short-term event to make immediate improvements. FMEA: Failure Mode and Effects Analysis, a technique used to assess risk in a process or a product design. QFD: Quality Function Deployment, a technique used to identify the “Voice of the Customer” and match customer requirements and technical requirements. DOE: Design of Experiments, a family of statistical improvement techniques. COQ: Cost of Quality, a quantification of the cost of poor quality. Set-Up Time: The time it takes to set-up a process to produce the next product, measured from the last good part of the prior lot to the first good part of the new lot. On-Time Delivery: A measure of the success rate of delivering (or shipping) on the date promised. Lead Time: The time quoted to customers (usually in days or weeks) between the date of purchase and the shipment date. Inventory Turns: the number of times the value of inventory is turned over in a year; 12 turns means that the value of inventory is turned 12 times per year or once per month. The number and extent of tools to help lean efforts is probably unending but these tools are vital. Value Stream MappingA graphical representation of all tasks and activities needed to transform input materials and information into an output. The 5S’s: A structured approach to clean and organize the workplace. Set-Up Reduction: Reducing the time to set-up or change-over a process. TPM: Total Productive Maintenance: Techniques to improve equipment reliability by reducing the frequency of breakdowns and failures. Here are some of the major techniques used in lean. Workflow Analysis: Analyzing the physical layout of a process flow with the intent of reducing travel distances, eliminating redundancies, improving communication and quality. Layouts & Work Cell Design: Using the results of value stream mapping and workflow analysis to improve the macro and micro layout of the process. Simulated Continuous Flow: With a step-wise batch operation, simulating a continuous process with small lot sizes (as small as a lot size of 1), elimination of WIP, and direct feed of each process step from its prior step. Pull Scheduling: Starting a new lot with an order from a customer. Kanban: A visual signal, typically a re-order card or container that triggers a pull manufacturing system. Load Balancing: Matching or adjusting the throughput rate of all steps in a workflow. De-bottlenecking: Improving the throughput rate of the process bottleneck. Starting and sustaining a lean effort requires planning and a stepwise implementation. The following nine start-up steps form a simple yet effective structure for introducing lean principles and practices to an organization. The Management Team must provide leadership by linking the lean initiative to the business strategy and communicating global measures. Lean champions should be individuals well-versed in lean tools and techniques and have the authority within the organization to help lean teams overcome organizational obstacles. Lean working subcommittees charged with coordinating such issues as Communications, Training, Project Support, and Best Practices are instrumental in keeping lean teams focused and on track. Regularly scheduled short lean communication sessions should be used to convey the why, what, who, and how of the lean initiative. In addition, provide on-going information in several formats such as your intranet, postings, and newsletters. Developing a training plan to support a lean initiative includes determining who in the organization needs to know what, how the training will be delivered, how facilitators can turn training into true learning, and where to find relevant resources. Pick a well-defined value stream for your pilot workflow. Layout and create a work cell. Lessons learned from laying out and creating a work cell in the pilot will be used when developing a full roll-out plan. Publicize the tangible value each improved workflow and layout brings to the organization; encourage other workflows to use and improve on the lessons learned. After completing the initial pilot and before involving the rest of the organization in the lean effort, step back and evaluate how the pilot went. Incorporate adjustments to the roll out plan. As with any process, as lessons are learned, make improvements to the lean effort. Modify and strengthen the infrastructure; select new tools to add to the “arsenal,” develop improved methods to measure and communicate progress; and challenge cells to constantly get better, faster, and more productive. All eight elements of lean are needed since organizations cannot be truly lean without predictable and consistent products, reduced set-up times, reliable equipment, and changes to scheduling, purchasing and accounting practices to support the lean effort. When adding lean elements to the effort, incorporate them on an as needed basis, not a linear fashion. People issues should always be addressed first. A collaborative, team-oriented, customer-focused environment must be fostered. Value stream mapping, workflows and layout usually follow addressing people issues. Document a current state map. Identify waste in the value steam map. Develop a future state map to show what could be. Use the future state map as the target for an improved workflow. The improved workflow is converted into a lean layout. The third step in lean implementation is usually introduction of the 5S’s. After addressing people issues, value stream mapping, and the 5S’s, what’s next? Unfortunately, there is no one right answer; it’s different for every organization. Lean efforts are not limited to manufacturing; a lean mindset applies to any process. Unfortunately, processes usually do contain waste, some more than others. Lean techniques can be used to reduce waste and add value to processes in the office, in maintenance, and even in sales and R&D. In some cases, the impact of a lean approach in the office can be even more dramatic than in manufacturing processes. While PM and TPM are obvious components of a lean maintenance approach, many lean tools and techniques can be used to establish a lean maintenance function. Workflow analysis can lead to simplifying maintenance workflows and streamlining layouts of maintenance work areas much like manufacturing work cells. A lean maintenance effort can lead to better equipment reliability, less equipment downtime, faster repair times, and overall, lower maintenance costs. When mapping the sales process, look for differences from sales person to sales person. Identify best practices as the basis for the future state. Look for disconnects, multiple handoffs, and redundancies. These are sources of waste. Consider beneficial technology such as automated contact management software and customer relationship management software for the future state. Automating the process saves time, helps maintain a standardized approach, and eliminates opportunities for human error. Much like sales, applying lean practices to R&D may seem counter to time honored beliefs. After all, how do you map innovation and standardize development practices? However, systematizing and standardizing basic R&D protocols can substantially speed the development process. Researchers can focus on innovation and customer requirements instead of wasting time and energy thinking through support processes. Lean and Six Sigma are complementary philosophies. The difference in Lean and Six Sigma lie primarily in the focus. The elimination of waste with Lean is fairly similar to the reduction of variation in Six Sigma. However, Lean’s focus on improving workflows is perhaps the main differentiator. By focusing on the workflows, lean efforts ensure that non-value-adding aspects are removed from the value stream. These are twelve of the most common reasons we have found to contribute to the failure of lean initiatives. A lean effort can probably succeed and even thrive with one or two of the dirty dozen in play. However, if your organization is guilty of four or more, your lean initiative is in serious jeopardy. Not really mistake-proofing the root cause. Thinking lean is just for manufacturing processes. Permitting a NIH mindset to exist. Failing to hold the gains. 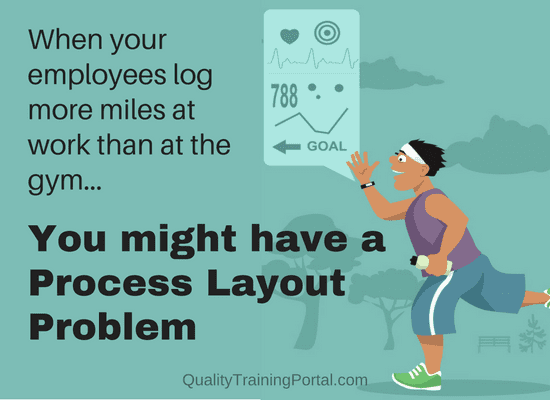 Process flow and layout are at the heart of lean manufacturing. In all cases, the flow patterns arrange the process steps in a natural flow order, link process steps to minimize cycle time and travel distance, eliminate crossover points, and simulate a continuous flow process by putting internal customers and suppliers next to each other. Each layout option has advantages and disadvantages. U-shaped flow is perhaps the most common flow configuration to implement. A U-shaped configuration allows the work cell to be laid out using a fairly small footprint. A straight-through (or an I-shape flow) is often the best flow pattern for long, narrow buildings. L-shaped flow configurations may work best for square-shaped buildings when several similar process lines are nested together. The comb and spine arrangement works well for assembly operations when products must exit the process flow at various levels of assembly. While each flow pattern has advantages, all, except the comb and spine, are variations of the straight-through flow. Other common variations on the straight-through pattern include the S-shaped and M-shaped patterns used to compress the footprint of long process flows. Which layout is best for your operation? While the U-shaped flow is arguably the most common layout for lean, other flow patterns can be used just as effectively. The layout shape used for any given workflow will most likely be a function of facility constraints and accommodation of other workflows rather than a pressing requirement for a specific flow pattern. Process flow considerations, physical site constraints, and the location of utilities all play a role in determining the facility-wide flow pattern and layout locations at a macro facility level. One of the first challenges of dispersing functional process equipment into a simulated continuous flow process is determining which equipment should be used for which lines. A dedicated line producing just one product is only feasible when the product volume requires the entire capacity for the line. More often than not a process line is used to manufacture a family of products. When determining at a macro level where in the facility a process line should be located, consider the bulk of the product produced on the line. Locate lines producing bulky products close to manufacturing entry and exit points to minimize the material handling requirements. If two or more workflows will share a common piece of equipment or resource, the layout for those processes must include easy access to that shared equipment or service. Shared equipment does present challenges beyond layout and location issues; protocols for scheduling and handling priorities need to be addressed as well. When planning the layout of a process workflow involving a complex assembly, the use of feeder cells to supply modules or subassemblies to a main assembly line is an effective lean manufacturing approach. Some in-process tasks may be contracted to outside suppliers such as plating, anodizing, or heat treating operations. The need to outsource can add another layer of complexity as schedules must be adapted to meet supplier schedules; as a result, the process may need to be treated as two separate workflows. The entry and exit points, specifically the location of the receiving and shipping docks, play a significant role in both the shape of the layout and placement of the various workflows. Building height is a major constraining factor for locating workflows within the facility. Obviously, processes that require high bay space must be given priority for placement in the high bay section of the facility and heavy equipment cannot be placed in areas not rated for the load. A process monument is a unit or piece of equipment that cannot or should not be moved. As the layouts for workflows are developed, the process must come to the monument. The location of monuments is a major factor in determining where processes must be located. Before selecting a specific layout for a workflow, confirm that needed utilities and facilities are available to the planned locations, forklift and personnel traffic can be routed effectively, and the equipment is accessible for maintenance. Learn how to use value stream maps to create macro-facility workflows and micro-process workflows. Understand how the 5S’s establish a structured approach for storing materials, supplies, and equipment in work areas. Discover how quality improvement techniques such as GR&Rs, SPC, DOE, DFA/DFM, and (especially) mistake-proofing help prevent problems and lead to robust processes. Investigate how to slash set-up and change-over times and understand how important fast set-ups are to lean efforts. Learn how to improve equipment reliability by applying TPM methods. See how visual controls and visual displays reinforce and enhance a lean effort. Recognize how important lean scheduling, lean purchasing, lean accounting, and lean warehousing practices are to supporting and sustaining a lean manufacturing effort. Explore the options for keeping a lean effort viable and vital.